Hello everyone, this is my first post in December. Wow, 2012 almost ends! Tick-tock, time is indeed scary by the way. This will be the busiest month ever because I'm running out of time to finish my thesis. Though I'm still being haunted by it, I'm actually so thankful for all the good and bad things happened to me during this year. Well, one of the good news is I am now one of WISHTREND First Ambassador! This amazing giveaway is sponsored by WISHTREND. 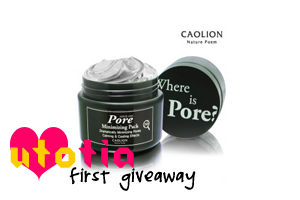 They are giving away one FULL-SIZE [CAOLION] Pore Minimizing Pack for you! For more details about this product you can go here. ATTENTION: WISHTREND ACCOUNT IS MANDATORY FOR THIS GIVEAWAY, SO IF YOU DON'T HAVE IT YET, SIGNING UP IS JUST A FEW CLICKS AWAY, DEAR. FOR THOSE OF YOU WHO DON'T HAVE IT, I HAVE TO REMOVE YOU FROM THE ENTRY. 3. Tell me honestly, what do you like the most and what do you dislike the most about my blog. 1. What post of mine do you like the most? (include the title)? 2. What kind of post would you like to see in the future? problem by the way..that's why..
of critics, you can give me advice if you think it's necessary).? detail explanations about your posts, keep doing like that,Tia..
event or something. cz I like The way you explain about them. 1. What post of mine do you like the most? (include the title) My Skin Problem 2. What kind of post would you like to see in the future? I like FOTD and posts about skin care ^^ 3. Tell me honestly, what do you like the most and what do you dislike the most about my blog. I don't like the layout; it is a bit cluttered. I do like how the posts are easy to navigate to see what you want to read! 3. Tell me honestly, what do you like the most and what do you dislike the most about my blog (though it's honest please arrange it in good kind of critics, you can give me advice if you think it's necessary). i really dont see any bad things here , and i love simply things also your post ! so , i give you one i like the most is your post ! 3. Tell me honestly, what do you like the most and what do you dislike the most about my blog . - What i like about this blog , is the not variant fonts . Why ? because its make us easier to read it . 1. What post of mine do you like the most? (include the title) :FOTD: How Lipstick Shade Can Change The Whole Look. aq suka post itu krn riview nya bgs shingga aq pngen coba produk itu jg..haha..
post tentang SK II, produk etude ny bs di perbyk jg biar jd referensi bg yg baca utk mencoba produk ny contohnya: skincare omija, O2 etc..
3. Tell me honestly, what do you like the most and what do you dislike the most about my blog..
> Like : riview yg km ksh mudah di mengerti dgn bhsa yg asik..riview nya ga cuma di swatch di tangan aja tp diaplikasikan ke muka shingga kliatan asli produk yg di swatch di tangan n di muka.Like!..soalnya kdg riview an org lain cm di swatch di tangan. > dislike: walapun riview km byk yg bgs, tp terkdg ada riview an yg sedikit plain..
lanjutan : Riview ny jg di bykin tutorial termasuk tutorial video youtube..
1. What post of mine do you like the most? I followed your blog since you review on Etude House NEW Fresh Cherry Tint in OR201. I think that is my favorite post, because of that I followed you. I already visiting your blog for several times before that. Ehm, what I like is your layout. I like anything related to clouds. And your header is cool too. I also like your review and try out posts, udah cukup lengkap ya. What I like less is some of your pictures maybe. The quality is good, but the way you took the photo, the technique or penataannya. I mean like the pics on the Etude tint I mentioned above. Sebaiknya jangan foto di atas tempat tidur dan jangan pada malam hari. Another thing, aku nggak tau ini cuma di laptopku atau nggak, blog kamu di laptopku jadi lebar banget, personally aku nggak suka kalau harus scroll kanan kiri, lebih suka kalau pas. Tak kecilin bisa sih, tapi jadi kecil kn tulisannya. Di laptop kamu gimana dear? Mungkin cuma di aku ini, karena laptopku layarnya lebar. dislike : post many product again..
1. I like ur post : REVIEW: Etude House Shini Star Clear BB Lotion, bcoz..i"m always looking for about BB cream reviews. 3. ur blog is same as another beauty blog, I'm also don't know what u're plus than the other, but I believe u're have something special that u know by yourself. Aku agak kurang suka sama tampilan blognya. Terlalu plain untuk kelas blog kecantikan. Mungkin kalau lebih berwarna akan lebih baik. Tapi untuk masalah posting sih menurutku gak ada masalah..
A Perfume Workshop by Lux. The fact that civet is one of the main ingredients of men perfume is a trivia worth-knowing. Any fashion and beauty related posts that haven't been done before by other bloggers. Something original that differentiates your blog from other blogs. What I like the most: The new header. Clean, sleek, simple, yet still feel stylish. What I dislike the most: Your update frequency perhaps, I hope that you can post more blog posts. 3. Suka= Re-view produk kebanyakan masih menjangkau keuangan. Harga prodk rata-rata harganya standart. Produk-produk mudah ditemukan di sekitar kotaku. 3. What i like the most is layout. Karena begitu buka web kalau layoutnya rapih begitu rasanya seneng banget bacanya. 1.what post do u like the most? review nyx soho glam collection...reviewnya jelas dan swatch warnanya jelas banget..
Hi, my name is Irma. 1. I like "My Beauty Diary - Honey Strawberry Mask" because personally I am a big fan of face mask, I like to try different products. I got to know about the Taiwan face mask product that you wrote in this blog. It makes me want to try it, too. 2. I would like to read more about DIY, especially in face mask and perfume. 3. I like your blog design and layout. It is simple, but adorable. The only thing I want you yo change is your font size (because I wear glasses) so this blog can be more enjoyable to read. 1. what post of mind do i like the most : lately, im enjoying the Shangpree product review. karena itu jadinya googling, dan pgn beli. ok. noted as my to-buy-list. bahhh!! like : ur english, seriously, it helps blogger being worldwide. amin. lol. dislike : about not-so-good picture quality or angle. sometimes. sorry, not to be rude. 2. What kind of post would you like to see in the future? review dan tutorial. bisa pke produk lokal maupun luar. i like the most review.klo yg aq kurang suka backgroundnya terlalu polos. - My First Box from WISHTREND! DIY untuk skincare kayaknya, hehehe..
aku suka bahasa kakak, mudah dimengerti dan nggak rumit.. kalo yang aku kurang suka, aku nggak tau, hehehe.. soalnya kan blog aku sendiri masih banyak banget kekurangan..
Tiaa.. this is my entry for your giveawayy! tp yg paling wah pas tau km jd brand ambassador wishtrend and got your first box from them! the title is "My First Box from WISHTREND!" 2. What kind of post would you like to see in the future? FOTD!!! ^^ kalo bs ada make up tutorial buat make upnya..
As I was really trying to find different reviews on bb cream. like: i like the way you write. Thank you for the invitation, same I am a new follower so I don't really know that much about your blog. But I'll try to answer your questions anyway. Why? Because it's the first page I open from your link, so I am happy to know this giveaway! For me it's always DIY posts, I love DIY, it's cheap and you can spend your spare time doing it! What I like : I like the template, very neat!